Binance is an up and coming cryptocurrency exchange with a focus on crypto-to-crypto trading. The platform has started to gain popularity in the blockchain community thanks to its impressive coin offerings and insanely low trading fees. Although the company was launched just a few months ago (via ICO), the exchange is already being promoted as a good alternative to Bittrex. There are two options for trading platforms on Binance: Basic and Advanced. I’ll be primarily covering the Basic trading option in this article, but you can check out the Advanced view below. There are not many differences between the two views with the exception of being able to do more detailed technical analysis in the Advanced view. Even the Basic view is fairly complex and not ideal if you’re just starting to invest. It’s obvious that Binance was not created for the casual investor. The main dashboard has several charts and graphs including the order books, a candlestick chart, as well as the trade history. There’s also a depth chart of the orders that you can view in a separate tab from the candlestick chart. To begin trading, you first need to fund your account. To do so, click on the “Deposits Withdrawals” link under the “Funds” tab. On the “Deposits and Withdrawals” page, choose which cryptocurrency you’d like to fund your account with and click “Deposit”. Binance provides you with a public wallet address to send your funds. I recommend that you fund your account using either Bitcoin or Ethereum because those are the two coins with the most trading pairs. This gives you greater flexibility when trading. Once your account has some funds, you can start investing. 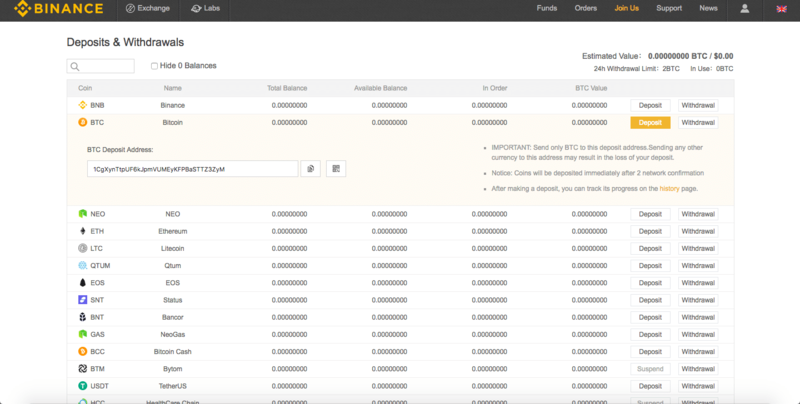 Navigate back to the exchange dashboard by clicking “Basic” under the “Exchange” tab in the upper left-hand corner. On Binance, you’re only able to make limit and market orders. With the complexity of the interface, I would expect there to be more advanced trading options, but those things may be added as the company matures and grows. Binance currently charges a flat 0.1% fee on each trade. For an exchange that doesn’t use a fee schedule, this is one of the lowest fees I’ve seen. If you pay using their own token (BNB), you currently receive a 50% discount on the trading fee – bringing it down to 0.05%. With this discount, Binance easily has the lowest fees in the industry. Binance is strictly a cryptocurrency exchange, so you’re not able to fund your account with fiat currency. You can only deposit cryptocurrency funds, but there’s no limit on the amount that you can deposit. There are also no fees on any of your deposits. The amount that you can withdraw each day is determined by your verification tier. Without submitting any verification details, you’re placed at Level 1 and can withdraw up to 2 BTC worth of cryptocurrency a day. To be classified as Level 2, you need to enable either two-factor authentication or Google Authenticator. Right now, only Chinese numbers are supported for two-factor authentication. With Level 2 verification, your daily withdrawal limit increases to 100 BTC. I’ve been increasingly interested in Binance recently after seeing it suggested time and time again on forums as a better alternative to Bittrex. Community members seem to love this exchange. Binance is one of the newest exchanges in the industry. The company raised around $15 million in an ICO this past July (2017) and immediately acquired 20,000 registered users as part of the raise. Changpeng Zhao, CEO of Binance, has an impressive resume with years of experience in cryptocurrency. He was the Head of Development at Blockchain, Co-founder and CTO of OKCoin, and the Founder and CEO of BijieTech before working on Binance. Information about fund security is not available on the Binance website, and I wasn’t able to find anything on any forums regarding it. This is not a good sign, and I advise you to proceed with caution if you decide to use this exchange. All I can confirm is that Binance allows you to enable two-factor authentication or Google Authenticator for your log-ins. The customer support area on the Binance site is lacking in comparison to other exchanges. There’s a short list of FAQs that failed to answer a lot of the questions I had as I was using the platform. Because the website was originally written in Chinese and translated to English, there are sections (especially in the support section) that have confusing grammatical errors. I’m going to give Binance the benefit of the doubt of this, though, because the company is young, and it’s impressive that they support multiple languages this early. You can submit a support ticket through an online form and get a response via email. The official Binance Reddit page states that your ticket won’t be answered by a random support agent but rather by someone integral to the company who knows the system you’re using. Even with the love that this exchange gets from the community, I’m staying away until it’s a little bit more established and its security procedures have been proven to be successful. If you’re willing to roll the dice, the myriad of coins and low trading fees found on Binance are unmatched, and you may find that it’s worth the risk to use the exchange. This article by Steven Buchko was originally posted on Coincentral.com and has been republished here with permission.